Save the Children believes every child deserves the chance of a bright future and we work hard to make sure nothing stands in their way. We need to be there when kids need us most – and that’s exactly what Workplace Giving helps us to do. It’s an important source of funding that helps us plan our health, education and child protection work in advance – and ensures we’ll always be ready to respond to emergencies, whatever happens. Paul Ronalds, CEO of Save the Children Australia. 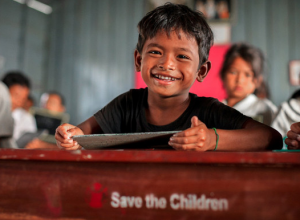 Workplace Giving is one of the easiest ways to support Save the Children. Donations automatically get taken out of your pre-tax pay, which means you instantly receive a tax deduction. So everyone benefits – but most importantly, children here at home and overseas. Your Workplace Giving donations to Save the Children will make a big difference to the lives of children here in Australia and around the world.